Since I last wrote about Lives of the First World War (LFWW) back in May 2014 the site has improved its user interface with the introduction of the Timeline and with additional helpful hints on screen to assist with the addition of evidence and facts. Remember you can click on any of the images in my blog to see them enlarged if you can't quite make out the detail or words. If a man does not appear in one of these data sets then you currently can't add information to the site, to his 'Life Story', for him yet. There are plans to add many more data sets in the future. Other record sets are available on the site which can be searched and linked to a man's Life Story, some, like the Commonwealth War Graves Commission records can be searched and attached for NO charge once you have created a free account. Others, such as census records, and Army Service Records can only be viewed and attached if you are a subscriber. Anyone can add photos and stories to the site to the Life Story of any man or woman of their choice - you just need to set up a free account (and I would recommend that you consider using a nickname when you do as the name you use appears on any record that you have added to). I will explain how to add some simple information in a little while. I am a Friend of the site, which means that I have the equivalent of a paid up subscription - however I have obtained this on the back of beta testing for the site, allowing the IWM to use my contributions as examples in their talks and displays and as part of my annual Find My Past (FMP) subscription. A 12 month subscription to FMP allows you to have access to the premium features of LFWW for free on applying a code supplied by FMP on request. However any suggestions I make in this blog post will apply to users who have NOT paid a subscription because I want to make it plain and easy for everyone to use the LFWW site to remember their First World War relatives. Being a Friend and having premium access allows me to create Communities. This is a way of grouping the Life Stories, that is men or women's records, into sets which reflect some aspect of the First World War or your local community. There are Communities for individual ships for example, for separate army regiments or as I am doing for the Barnsley War Memorials Project (BWMP), for each parish or township in the Barnsley area, with a few more for individual war memorials where they are particularly unique, such as the Salvation Army Memorial Plaque. As you can see in the snip above I have added over 1000 men to the core BWMP community and then various numbers of men to the named sub-communities. A man can be added to any number of communities. Some of our Barnsley men are in as many as 6 communities because they appear on multiple war memorials, are mentioned on a war memorial gravestone (I have a separate community to keep track of these), and they are named in Jon Cookey's book Barnsley Pals, which is an invaluable source of reference for the 13th and 14th battalions of the York and Lancashire Regiment and which drew most of its men from the Barnsley area. Anyone can find one of the Barnsley War Memorials Project's communities on LFWW. Just put the word Barnsley in the search box at the top of the page and click the magnifying glass logo. When the results are returned choose Communities on the left hand side, wait a moment and then you will see all the communities containing that word - they might not all be mine, but you can spot them easily enough, they have the BWMP logo and strapline underneath each one. Currently both Fay Polson (Wombwell and Jump) and I are creating BWMP communities. A friend recently asked me to set up a community for her local war memorial - remember that only subscribers have the power to do this - and as it is a Barnsley war memorial I was happy to do so as I would have got around to it eventually (I have such a long 'to do' list you wouldn't believe!) Anyway I did and she tried several times over the Christmas holidays to add information to her men, but couldn't quite work out how to do it! Once you have logged on you are taken to the Dashboard page. This shows a list of any soldiers you have Remembered and gives some up to date statistics about the site and links to helpful hints and other useful information - like the lists of records available I showed you above. Find your man! You will need to know a little bit about your man or woman's WW1 career to find them. Name and service number is the best way to do it - a service number can be found on the Commonwealth War Graves Commission (CWGC) website if the person died. If you have WW1 medals the service number will be inscribed on the edge of each medal. Alternatively you can try name and regiment and hope the surname you are searching for isn't too common to pick your man out. 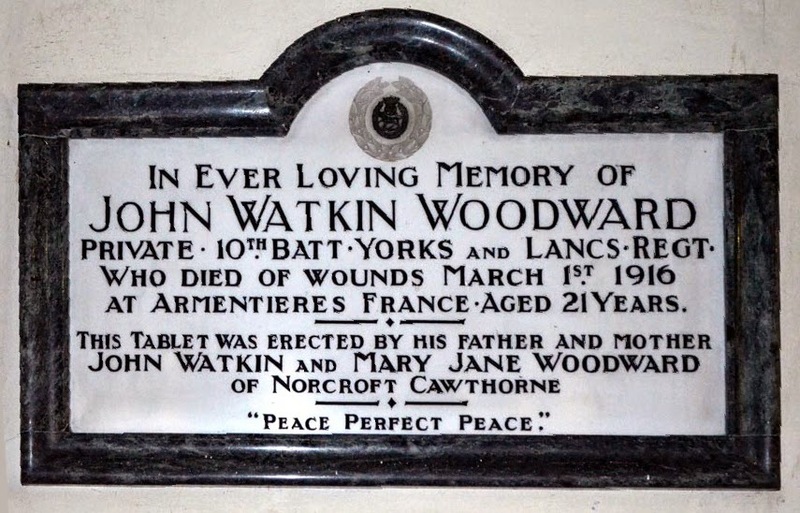 The above is a memorial plaque in Cawthorne Church, it gives us this man's name, regiment, date of death, age and parents' names. Very useful. No service number though. However using his name, initials and date of death I can find him on the CWGC website quite easily. His service number is given there as 3114. Searching for Woodward 3114 on LFWW does not bring back any results, so now try again with a * in front of the number. Woodward *3114 brings back two possible men and only one is a John W Woodward in the York and Lancaster Regiment, the other is an Ernest Woodward in the Durham Light Infantry. Found him! I also tried searching for John Watkin Woodward and got no results, searching for John W Woodward brought back 10 men, but I could filter them by regiment to see only the ones in the York and Lancaster Regiment and that cut it down to 2. Both are unfortunately a Private John W Woodward, with different service numbers, no further information available. If you get to this point and there is no additional information such as date of birth or death on the records you will probably not be able to work out which is your man. So cross your fingers for an unusual surname or uncommon regiment or rank, or go and do a bit more digging in your paperwork for a hint to his service number. If by any chance both (or more than two sometimes) results show the same service number and a similar name, maybe one with full name and one with initials only, these will probably be the same man who has a duplicate medal card because he received an award of some kind, maybe the Military Medal or similar. Alternatively I have heard of men who are listed in both the Army and the Air Force, because they transferred at some point. Whatever ... in that case choose one of the records (if one is being remembered already choose that one) to add your data to. Duplicates are being reported all the time and will be merged at some point in the future. Our man is the bottom one on the snip above - we know his service number was *3114, you can see that this man's full number is actually 3/3114 and that he is being Remembered by one person. Click on the name! This will open up the Life Story page on the new Timeline view. Remember your man! Always do this first. Just click the big turquoise-blue button that says "Remember". This will enable you to find this Life Story again very easily as he will appear listed on your Dashboard page. In this case the Remembered number goes up to 2 to indicate I have been successful. Of course if you are the first person to remember your man it will change from 0 to 1. But you had worked that bit out for yourself hadn't you? What do you know about this man? Are you going to add a photograph or a story or some other evidence? You cannot add facts about a man (you know I mean man or woman but it is getting tedious to type that all the time so please bear with me!) unless you attach the facts to a piece of evidence. This can be a photo of his gravestone, a scan of his birth certificate (if you own it - not if you have downloaded it from Ancestry or FMP or any other pay per view site as you don't own copyright to the image in that case) or a extract from a document or book that you have seen and can reference. Let's add a picture - that's pretty straightforward and if we add an image of the memorial plaque I showed you earlier we can then use that as the source of evidence to add his date of death and his parents' names. Bear in mind that once I've done this to show you how to John W Woodward is not going to look the same as he does in my initial snips - we will have 'improved' his Life Story. Select the Images option on the toolbar. It currently says Images 0. If there is no profile picture selected for your man, as in the snip above, you can click directly on the profile box, where the little camera icon appears and that will open up the dialogue box to add an image directly. If you go via the Images option route you now need to click on the words "Be the first to to add your own images" or "Upload your own images to this Life Story" which will be in bold font to the right of the page. In the Images dialogue box click in the box where it says, "Click to upload image ..." and then you will have to browse on your computer to find the image and select it. A little thumbnail image will appear in the box if you are successful. It doesn't work first time on my Samsung Tablet, but then it is an old model, but I can usually get it to do it eventually. On my laptop it works quite straightforwardly. Now you need to add a caption - in this case I am going to add "Memorial Plaque in All Saint's Church, Cawthorne". The description of the image should be a proper description - imagine that the person viewing this website might have poor eyesight and be having the page read out to them by some special software - you need to say what the picture is with a little bit of imagination. So in this case, "A white marble plaque with black border, commemorating John Watkin Woodward". Don't worry about a complete transcription we can add that later. If the photo is from a newspaper or you know the date you can add that here too. And finally tick at least one of the boxes to say why this item is connected to your man. In this case I will tick, "Name or other information in the image". You don't have to put anything in the bottom box, but if you tick Other it is nice to explain your reasoning! Think of the other people who will be looking at this record. Now click Connect to *your man's name* and the job is done. If you clicked in the profile picture box your image will have appeared there automatically, if not you can make it appear there by clicking on the picture and choosing "Set as Profile Picture" from the bottom of the dialogue box. Add some Facts! We are going to use this evidence to add the date of John's death to his Life Story. Open the image dialogue box by clicking on the picture, and click on "Add Facts from this Evidence". NOTE! Only add facts which appear in this particular piece of evidence or which can be deduced from the evidence. We can't add his date of birth, but we can have a guess at his year of birth from his age and date of death. To add his full date of birth we will need more evidence. The dialogue box that opens now is very long - scroll up and down a bit to see all the options. We are going to add facts to just a few of these, but it gives you an idea of other facts that you could add if you can find evidence to support them. Once you are familiar with the various facts you can jump to a particular one by starting to type its name in the white strip at the top of this box. We are going to add John's date of death and that is fairly near the top and visible on this snip. Click on the word Death to open up yet another dialogue box. We are very lucky in this case that the memorial plaque gives us the place and country in which John died. So I am going to enter Armentieres and France in the first two boxes (Countries are picked from a long list when you click on the box), his date of death is entered as 01 03 1916 and I can also choose "Died of Wounds" from the Nature of Death pick list. If you don't know any of this information for your man leave the boxes blank. Don't guess, it will make the whole exercise of gathering proper evidence and facts pointless and could mislead future visitors to the site. Once we have done this click the Continue button. I would recommend saving between each fact you add, just in case your computer throws a wobbly or you accidentally hit a wrong key somewhere along the way. Scroll right down to the bottom of the long list of facts that are available to add and you will see a panel headed "Summary of Added/Improved Facts" and at the bottom of that is the very important Save These Facts button. Click this and the pop up "Thank You" screen Continue button and breath a sign of relief. You have successfully added information to Lives of the First World War. Well done! This is what John's Life Story page looks like now - he has a profile picture and his date of death is visible. It will be visible on the search screens too - useful for other users looking for him in future. The process for using different kinds of evidence is similar, but you must use the Evidence option to link or reference the External Evidence you have found BEFORE you start to add facts. I know I'm getting a bit heavy on this topic, but it is very important that each fact is supported by its own evidence - it's like providing a trail for people to folllow so that they can look up the same facts as you at any point in the future. You will find you have a choice of website, book/publication/archive or copy of official document. Selecting one of the little round spots (known as radio buttons in the trade) will change the boxes underneath where you add your captions and descriptions and ticky proof boxes to suit the type of evidence you have selected. I hope you can work this out for yourselves as I'm getting a bit tired of typing this afternoon ... but I promise to come back another day and have another go at explaining these boxes and finding and attaching a free record too. Of course you might just KNOW something about this man from a family story ... in which case you can just click the Stories option on the tool bar on your man's Life Story page, click on "Share it Here" and type away to your heart's content (within the word limit of course!). Any stories to which you add a date will appear on the timeline page in the correct place. Take a look at Edwin Betony, one of my Barnsley War Memorials Project men for an example if you like. I hope this has helped. Good luck with your research! And remember the whole purpose of this is to commemorate and honour the men and women who played a role in the First World War - they deserve us to try our best to create this digital memorial - don't let them down!